Can someone please help me by telling me what these letters and numbers mean? Boy, are you going to like my answer! SE21 is actually, 5E21 which means the casting code is dated May 21, 1965. Now the fun part... The heads. A C5OE-A casting, means that you have 54.5 cc heads, with the larger 1964-1967 vintage 1.78 intake and 1.45 exhaust valves. The engine also has screw-in studs and integral valve-spring cups, particular only to these heads. 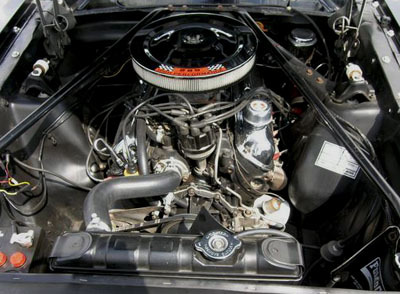 It means you have a 1965 Ford Mustang 289 V8 hipo engine, a very sought after factory performance engine! If you have the car that goes with it (finished or restoration in progress) , send some pics and I'll put it up on the page with your information. Hope to see it in a Mustang, cruising up the Island highway some day! The tab on the front of the block actually reads SF18090 not SF1090. Unfortunately I don't have anything to put this engine into. I bought it for a friend who then had to decline. Some one has spent a rather large sum of money on this motor. Head work was done in Canoga Park Cal. at Valley Head Service. Not sure about block, lots of work there as well. You're welcome. If you don't have a home for the 289 k code engine and are looking to sell it, let me know.